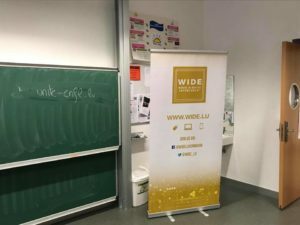 Thursday morning, the 8th of March 2018, WIDE was present at the Fieldgen school in Luxembourg city to celebrate International Women’s Day. 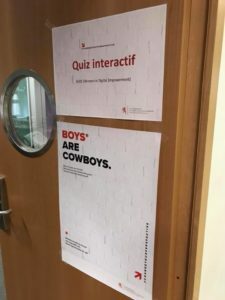 This event organised by the Ministry of Equal Opportunities (Ministère de l’Égalité des chances) raised awareness about women’s rights and inequalities with men, thanks to many workshops around stereotypes. 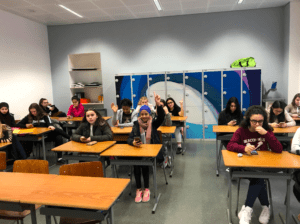 WIDE presented an interactive quiz around women and equality and discussed with the students about their opinions and thinkings on the subject. 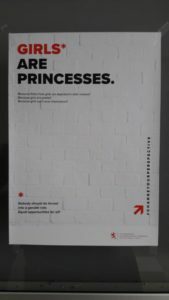 This quiz was accessible through the app “Unite” created by WIDE in association with the CNFL (Conseil National des Femmes du Luxembourg). The different quizzes focus on many themes such as education, politics, health, and violence. Students could answer the different questions through their mobile phones. Each answer was followed by an explanation of Marina Andrieu (director and co-founder of WIDE) and discussions. We welcomed two different classes one of 7th-grade girls (approximately 12 years old) and another one of 16-year-old girls studying to become care assistant. In total, around 30 girls took part in our activity. Some of them already had knowledge about the topics, some less. Nevertheless all of them were really interested in the subject and it allowed them to expand their knowledge about women in the society. It also triggered their interest to develop further at home or at school the subject.